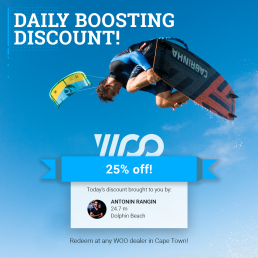 Want Exclusive Passes to King of the Air? How about official KOTA Merch signed by the KOTA Riders? The season is in full swing in Cape Town and together with our friends at Red Bull South Africa we wanted to give you a chance to win an exclusive experience at the 2018 Red Bull King of the Air! Watching the best kiters in the world push themselves is always a rush but this year why not do it in style! So here’s how you win! Now through Jan. 25th log your WOO Session using the hashtag #RedBullKingoftheAir for your chance to win. Every session you log gives you a chance to win! Additionally we will randomly select 2 Wild Card winners! Wild Card winners will be randomly selected just like a raffle. Every WOO session you log with the #RedBullKingoftheAir will count as a “ticket” so the more you ride the better your chances are! Get to the nearest kite shop in Cape Town and grab one! They are offering Daily Discounts of up to 30% off so the time has never been better! Terms and Conditions: Contest is open to anyone who logs a WOO session in South Africa. Winners will be contacted the night of the 25th and will have 24 hours to respond and claim their prize. Sessions saved after 8pm on Jan. 25th will not count towards the final results. If the winner is not available to attend KOTA 2018 or otherwise does not respond another winner will be picked and contacted. Winners must arrange to pick up their VIP wrist band and prizes before the first day of the contest. VIP wrist bands provide access to all areas of the contest venue and VIP lounge. WOO Sports reserves the right to change or amend rules at any time without notice. Finally remember, this is supposed to be a fun challenge so please remember to stay safe out there, have fun, encourage your friends and #PlayMore!